A Faster, Better, Open Source version of Turing. 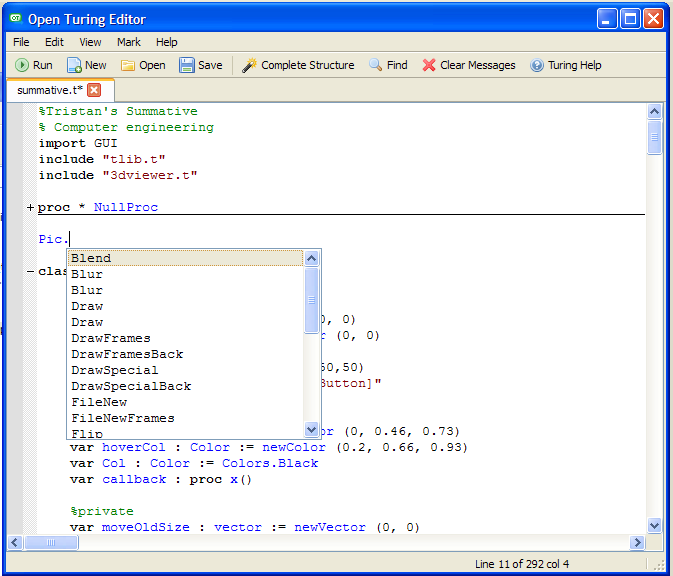 Open Turing is an open source fork of Object Oriented Turing 4.1.2 for Windows. It is up to 50% faster, includes new features like 3D support, and is constantly being improved. Depending on the program, Open Turing runs things up to 50% faster than Turing 4.1.1. The largest speed gains are found in games that use Pic.Screenload. Previously these games were very slow but due to the addition of caching in Open Turing these programs now run at a normal speed. No code modifications required. Hash maps are a special data structure used to associate values to strings. For example, associating words with their definitions. Open Turing includes fast hashmaps built in. Good programmers have always been able to implement their own Turing 3D libraries but they have always been very slow. Open Turing includes very basic support for OpenGL 3D. This allows fast rendering of thousands of 3D shapes. Turing is a clean language similar to Basic and Pascal that is excellent for beginner programmers. It is object oriented, statically typed and has an extensive standard library. Turing has a very easy to use graphics library that is great for making simple games. It also allows image drawing and manipulation, sprites and animation. Beginners can use names like "red" and "brightgreen"
Intermediate users can use color numbers to choose between 255 different colours. Advanced users can use the RGB module to access every possible colour. Auto-complete makes programming way more efficient. It looks for variables and functions in the current document and the standard library, when you start typing it pops up a list of possible things you are typing. You can keep typing to narrow down the list or select an item with the arrow and enter keys. It is written entirely using the cross-platform Qt GUI toolkit. This is the first step towards full cross-platform compatibility. The Qt toolkit also leads to clean, maintainable C++ code, making it easy for anyone to contribute. © The Open Turing Project 2012. Site designed by Tristan Hume.